The Official Pantheon Wiki and Developer Interview! Names like Brad McQuaid and Salim Grant are legendary, well known names in the MMO realm. Naturally, you would not believe the absolute excitement at Gamepedia and Curse when, not only did these two join forces again, but this time, they are working on their own terms to create the experience of nostalgia we've been waiting for. This experience is called Pantheon: Rise of the Fallen and we couldn't be more pleased to say that the official wiki is here at Gamepedia! Pantheon is currently in the middle of its Kickstarter campaign, full of reward tiers to please anyone! Original EverQuest and Vanguard: Saga of Heroes fans might enjoy this reward because it comes with a cloth map! To learn about contributing to or editing the official wiki, please check out the Help Wiki for tips on getting started. Recently, Gamepedia and Curse staff sat down with both Salim and Brad, along with Ben de la Durantaye, head of PR at Visionary Realms. You can read the full interview here, or listen to the interview on our YouTube channel. Below the video are a few amazing answers to get you as excited as we are! [SG] Salim "Silias" Grant - former Creative Director for Vanguard, etc. [MC] Michael Comperda - CTO, Curse Inc.
[ZS] Zak Steltz - Product Manager, Curse Inc.
[BT] Benjamin Tarsa - Community Manager, Gamepedia.com, Curse Inc.
MC: Cool. I have a question now regarding quests: So, in EverQuest, quests are fairly rare and are not really a major focus of gameplay. This has really lead to far more player freedom, where grouping happens more organically around personal goals, not questing goals entirely. To a large extent, Vanguard sort of abandoned that design from EverQuest, in favor of offering players thousands of quests, more like World of Warcraft. I was curious, what is your current take on the role of questing in an MMO? SG: We...our current outlook on questing is more like EverQuest or Final Fantasy 11, we don't want you to have a quest journal that's filled with quests that's “just go here, here, here and here” – you're not really experiencing the game. We want you to, like you said, more organically group and just kind of go somewhere and discover things together and, if you go to this spot and you know there's a particular NPC that drops something cool, you want to get friends together and try to get that item. We're definitely going for a feel like that. We feel that EverQuest definitely did well on the social front, because people had – it was kind of a slower pace, and they didn't have...they weren't looking at a UI element that was their quest journal telling them to go from A to B to C to D. Here's XP and here's some sort of a reward. We want people to interact with each other. We want people to talk to each other. We want them to get to know each other a lot better, whether via in game voice or chat. So yeah, as far as the number of quests, this is one of the first things brought to me when we first started having design meetings. We're very focused on fewer quests, but when you do get those quests, they are significant. Things like Epic Quests will definitely exist. I don't think I can talk to any designer on the team and ask them if they want to do Epic Quests and have them say no. That is an exciting thing to put into game, because we understand the player point of view that the accomplishment is so significant, that it creates memories for multiple people, obviously. It's not just a solo thing that you'd be doing. MC: Cool. Well, the questions related to geography and starting areas. 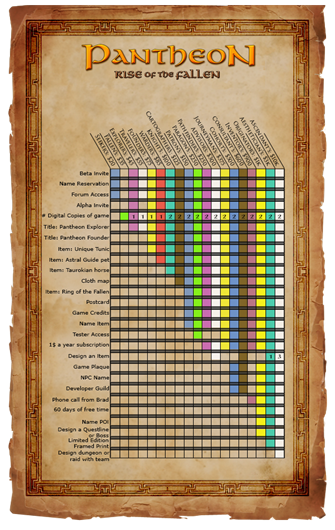 Both Vanguard and EverQuest offer players a large variety of places to start. I know Vanguard kind of backtracked on that recently. But, you know, they were designed around the idea of having many races, different cultures and they really having a completely different experience of where you started. Many current MMOs that are popular right now have abandoned this design in favor of having just a couple of starting areas. What are your thoughts on starting areas for Pantheon? SG: Our current lore...the way our current lore works, we won't have a bunch of starting areas, but it's just really derived from the way our planet works. Just the fact that there's a lot of these planar collusions, mixed together with what your current character represents. It works within our lore pretty well. But the makeup of where you do start, we want to get across the ocean of different cultures, but our game is really focused on the varying pantheons and how they really mesh together and what comes out of that, whether it be, you know, rivalries, war, whatever. With the way our lore works, it really didn't contribute to having a bunch of cities all over the place. So...I think that answers the question? BM: Here's something that's important to us, and that is, you will probably hear Salim saying “fewer cities” but, those cities could have areas where you start depending on your race, kind of like how San Francisco has a Chinatown or what have you. We really wanted to get away from spending all of this time creating these places that people just start out in and might use for a merchant or something. That's a lot of work and we'd rather build more dungeons. MC: Gotcha. That's a good way to put it. MC: Yeah, so, one of the reasons why we play these games is for some of the cool stuff we get, and specifically, items. So, in EverQuest, the world offered the ability to not only explore the georgraphy, but the items that you would find in these new areas, which were unique. Items were obviously dropped less frequently, and, made getting a drop more meaningful. A more impactful thing. So, I guess, what my question is: what approach are you taking towards itemization at a high level, with Pantheon? SG: Once again, very much more old school. The number of upgrades, you know, between this level and, you know, level one to level 30, or whatever, you're not going to have a whole bunch of upgrades in there. We want you to, to be able to, at the end of the day, be excited. I got an SMR. And you love the SMR. If someone asks you what items you have equipped, you can name them all by name because you spent time getting them and those items are with you for a long time. You don't get a robe and then the next day, get another robe and (sighs) oh darn. And that kind of goes back to having a bunch of quests and things like that and having to reward people with those. We very much want to, as you described, it's much more like EQ or other games back then of that type where you go find a spot, you see a new mob, and it drops something super cool. Awesome. It's very unique and you made a server first. You got the first person for a little bit and that item is going to stay with you and that item is special. It's unique. It doesn't look like it was generated with something and it was one of four or five items throughout the world that have plus one or plus minus a stat. You earned the item and it feels like a part of your character. A part of you. MC: So would you say that the loot tables are more deliberately set versus just sort of a random distribution? MC: Cool. So, I've got a question about dungeons. Zak can attest to my interest in exploring every dungeon in a game, and try to crawl through it and see every part of it. The dungeons in EverQuest and Vanguard both were incredible. Sebilis, Unrest, Kael [Drakkal], I mean, the list goes on. In Vanguard: Trengal [Ruins of Trengal Keep], Dargun's Tomb...I mean, I've experienced them all. I love them, but a lot of games don't get dungeons right. They're very formulaic or they have a hallway here and there and you're done. What are your thoughts on dungeon design going forward? SG: Once again, you kind of hit the nail on the head, right? Anyone whose been playing since EverQuest, you ask them what are some of their favorite dungeons, Sebilis would probably be on that list. North ToV. And we want to bring that back. I don't want to say that there's, that MMOs today don't have great dungeons, because I don't know if that's a good general statement to make. There's a lot of well designed, cool dungeons in all MMOs today, but we definitely want...you know the fact that we're keeping things open means that we're going to have these huge, hopefully huge, epic dungeons, that you're going to experience and bring back those experiences like Sebilis, like when you were in Kaesora, things like that. We want to bring back that sort of of kookiness back, you know, traps in the ground, and things like that. To have to be careful and slink through the dungeon and knowing that there's other people there. Shouting, you know, “Oh hey, I'm coming to the zone and there's a mob with me.” Things like that. Not that we want to bring a bunch of trains back, but just as an example of the nostalgia. We're definitely looking at it that way. We want dungeons to be awesome, obviously. We want to get some great dungeons out of it. I'm actually really excited about getting in there and seeing what we can do dungeon wise. BM: Me, too. I'm the same way. I want the huge dungeon, there's multiple routes, different locations, there may be multiple entrances, multiple exits...we want to bring that back. MC: Sounds like you guys pretty much have dungeons well under control. That's good. BdlD: Sorry, just gonna add real quick that as a reminder, too, that the guy who actually made those dungeons, like the Sebilis and stuff, he's actually doing our dungeons as well. SG: Yes. Yeah. Awesome guy. BM: He's making 'em right now! Full interview is here and the transcription is here. Don't forget to become a backer of Pantheon on Kickstarter and a contributor for the official wiki!